In the latest installment of the Beginner to Blogger series, we have one of the most productive bloggers I’ve ever met – which is saying a lot! Mike Monfredi of MikedUp Blog finally shared his secret… Somehow he manages to squeeze 25 hours of every day! In this interview, Mike talks about why he and his family is working toward financial independence, what his favorite splurge is, the area of personal finance he’s still struggling with, and more. Hello, Personal Finance For Beginners Readers! I’m Mike Monfredi – CEO of our family’s small business, founder of MikedUp Blog, and I dabble as a forensic scientist (for my day job). My wife (Monica) is my boss (she is the dentist and owns the practice) and the epitome of what an amazing person should be. We have our 3-year-old daughter and another on the way! MikedUp Blog is all about helping readers unlock a better version of themselves through improvements in fitness, personal finance, and small business ownership. It’s not me up on a high horse, but rather us growing together. And as I’ve found a lot lately, I have plenty of “teachable moments” that have cropped up throughout my life. It was a perfect storm of terrible conditions and anxiety that finally forced me to get a handle on our finances. I graduated from college in 2008 (smack in the middle of the Great Recession), Monica and I were soon engaged, and she was sending out applications to dental schools around the country. We thought this was “as crazy a time as there could be” (until we later bought a business, bought our house, and had our daughter within the same calendar year), and there was one consistent theme that persisted – we were spending money with ease… And didn’t have the income to support it. When Monica eventually chose a dental school and we saw what that price tag could be, we decided to make some significant changes. I immediately got a job, hurried to finish up my graduate degree, and we ultimately lived the frugal lifestyle for the next five years (her four years in dental school plus the year after to get our bearings). While some of her peers graduated with $400-500k in debt, we came out of the deal with about $250,000 combining undergrad and dental school together… Not too bad with all things considered, but still less than ideal. The 5-year process of cutting our expenses to the bone, working odd jobs, and focusing exclusively on our financial situation gave me an MBA in personal finance. The blog started from there, has now graduated into business financial topics, and likes to help you lead a healthier lifestyle on the side. Let’s see, there’s losing 50% of our net worth during the market crash, leasing a BMW 128i when I was starting grad school, not saving a dime for retirement in the 2 years it took to save for and buy our business… hmm. Let’s just say I’m no money saint. But I can single out a non-Mike-made financial obstacle that stands above all the others, and that was the process of buying our business. We didn’t set out with the goal of this being a “hurdle” type of a process, but it was very complicated by the end. So, in the time we had decided to buy a business until we landed on “the one,” we stopped contributing to our retirement accounts to save up enough capital for legal fees, overhead, and all the other expenses that come with buying a business (quite a few, in our case). We took a mindset of “a big step back so that we can make a giant leap forward sometime down the road.” And although we knew it would be expensive, we thought it would pay off in multiples down the road. But the process was fraught with valuations that couldn’t be agreed to, landlords that didn’t want to negotiate leases, banks not wanting to loan to us because of our debt-to-income ratio in combination with the fact that we’re paying so aggressively on student loans, the fact that we had to move our office 8 months after we bought it (and build a brand new one to move into)… There was a time that buying this business had become a nightmare, and while I was working my day job, trying to get the business together, blogging, parenting, husbanding… I burned out. It was one of the low points in my life, and I basically shut down from everything that wasn’t “mission critical” for about 4 months. From there, I had to refocus my efforts, climb back up out of the hole, and put some type of a system in place that would allow me to juggle all of these tasks I willingly took on. Fast forward to over a year later and we did purchase the business, ended up growing profit by 18.5% in Year 1, and life is starting to become normal again. The fruits of our labor for that 18-month period are starting to ripen and now we’re looking back with humility and appreciation for all of the hurdles we had to overcome. We’ve been completely focused on getting the business off the ground that I haven’t devoted the time needed to focus on our retirement plan. Every day this fact eats at me. And although it was a conscious decision to divert funds for legal fees and to set up the business, we’re losing valuable time that could be put toward compounding interest in our accounts. On the plus side, we had just made the final payments for our new office last month, and I have it in our 2019 Q1 plan to put a retirement plan in place for our business (including our staff). I’m excited to get back to investing as a family and I’m thrilled to be able to offer this benefit to our team that works so hard for the business. It’s a “win-win” to the core. I love this question… Because depending on the individuals asked, the answers can be wildly different (as you may have seen with this series!). To me – financial independence is the point in life you reach when you’re able to work as much or as little as you’d like to in whatever capacity you’d like to, because you either have enough passive income coming in or you have enough saved to cover your living expenses. 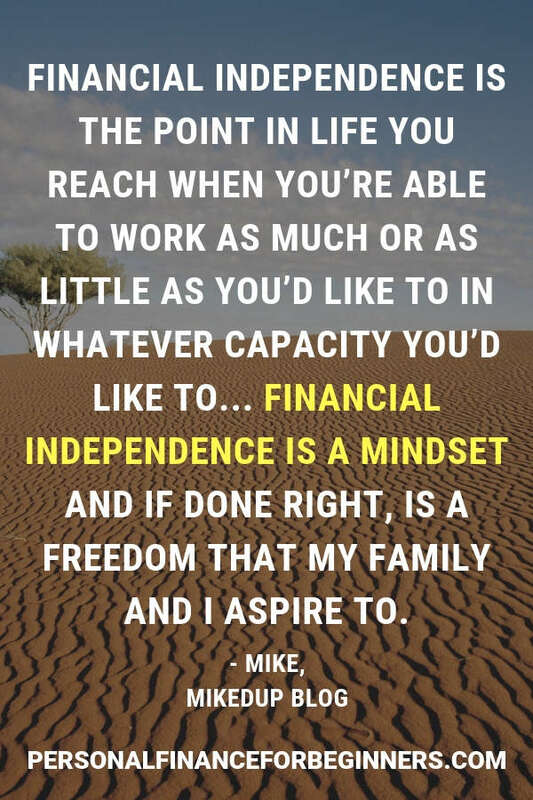 Financial independence is a mindset and if done right, is a freedom that my family and I aspire to. My situation may be unique. But since taking control of my financial life (about 3 years ago), I have been laying the groundwork since. And as a result, my quality of life has been up and down professionally. I routinely work 15-18 hours/day, I haven’t had a weekend off in a few years, and if I don’t schedule time with my family, it’s too easy to let those relationships suffer. However, this is temporary – and my wife and I have communicated very extensively about the work we are doing now and the time we are “sacrificing” now in order to achieve the goals and freedom (discussed in the point above) later. We worked like crazy for a year and a half to buy our business and to get the momentum moving in a positive direction. And after Year 1 we grew (18.5% as mentioned above), had a ton of positive reviews, and had started to form an amazing Team. For me, the business is now in more of a maintenance mode for the rest of 2018 while my focus has been on turning MikedUp Blog into a sustainable business. From July to August (and with the help of so many amazing people, including Aaron!! – thank you! ), I have been able to increase my traffic by 22X! It’s crazy to think about, but now that that goal has been achieved, my focus is on maintaining that level and hopefully succeeding beyond that point. I say all of this to say that although I’m “busy,” my scheduled time with my family 4:30-7:30 every weekday has been so rewarding and enjoyable because it has become my singular focus in that moment in time. No distractions, no doing 3 things at once… 3 Hours with the family is what I use to recharge, find joy, and get ready to crank out some more work for the evening ahead. The ultimate goal for my wife and I is to look back on this period fondly in 5 years as the time we had to spend to climb higher on the mountaintop. And as long as we’re being intentional with this time, I’m confident we’re using it wisely. First off – this is one of the most stressful and difficult times in a young professional’s life. So stop wherever you are, stand up straight, and take 10 deep breaths. Now that your blood pressure is under control, assess the damage that college did to you. Do you have loans? How much? Do you have a job lined up? Once you have an idea of the damage done it’s now time to come up with a plan for your financial future. I would advocate coming up with your financial plan based off of your goals and values – and not necessarily what you read in books or online (sorry fellow financial bloggers). I take the approach of reading a variety of different sources and then applying bits and pieces to our lives. This hybrid financial approach has served us well to date. Now that you have your plan in place, it’s time to get to work. Roll the sleeves up, put the head down, and work. The harder (and smarter) you work now, the more thankful you’ll be later. Hook up your future self and crush it today. Maybe in some situations, this is THE ideal scenario, but it isn’t by default the case. So many people overlook the fact that you can boost your income to get ahead financially. Don’t lose sight of this. You can crush it and get promoted at work, incorporate an effective side hustle, or become a landlord, for example. Whatever your jam, don’t think that the only way to win is to spend less. Waking up early. No question. Waking up early has helped me crush complacency, achieve more during the day, workout more often, and ultimately made room in my schedule for increased income and networking. All of which are helpful for both a personal development sense as well as a personal finance one. Don’t hit the snooze button… Get up and get moving! Vacations. We absolutely love vacations. We recently took an 8-night 9-day trip to Maui with our 3-year-old. It was a blast of a time and (at least for our daughter) the trip of a lifetime 😉. We spent about $7,000 on the trip including airfare, hotel, food, and other expenses. But the real truth of it is that we could’ve doubled that price if we weren’t somewhat zoned-in on saving. For example, we chose to travel in September rather than August (summer vacation season) and as a result, we saved about 33-50% on airfare and 25% of our hotel costs. We also didn’t eat at lavish restaurants – we were too busy swimming, playing, and doing fun stuff on the beach. We took a lot of snacks with us for the flight and for during our stay so we didn’t spend extra in the airports or at the resort. And most importantly, we saved up for this trip in advance so that we could pay cash. By doing so we paid no interest and had no stress during a time that should be all about fun and relaxation. This is cheating but I’d go with Extreme Ownership – How US Navy SEALs Lead and Win by Jocko Willink and Leif Babin. This is a personal development book but I’ve taken so much from this book to apply to my personal, professional, and family life that it’s not fair to fit this one into a specific box. More than that, I use this book as the onboarding program for our business. On a new employee’s first day, I hand them an individualized copy of the book and schedule our first meeting to start discussing the chapters. Every person was a little concerned at the onset, but each and every one has loved going through that exercise. It’s truly made us a better team. The boring answer is that I became bored with my day job – and I’ve since admitted this to my boss. I desperately needed a creative outlet and we hadn’t considered starting the business yet (I started the blog 2.5 years ago), so I decided to take my writing to the world!! Every reader loved each and every post for the first year or so (my wife, parents, in-laws, and conned friends)! But as I started to grow the audience, I started figuring out what people enjoyed reading about – and surprise! It wasn’t what I did on vacation last year… haha. The site is truly at its best point right now and I only see it improving from here. 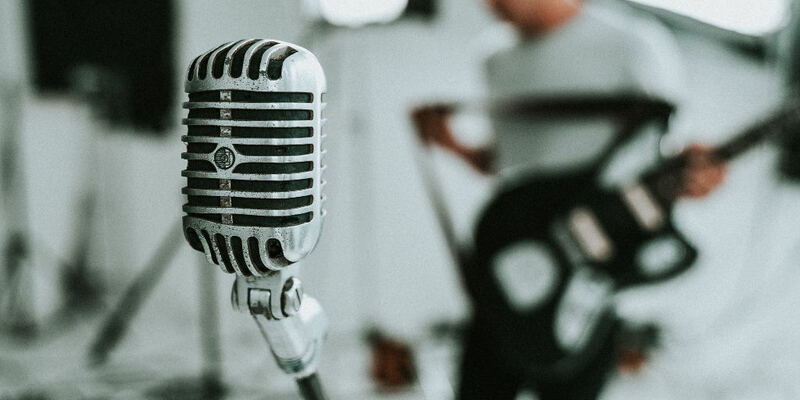 With more frequent contributors and more focused (and frankly better) stuff from me, I’m tackling the pain points of my audience and bringing about solutions and perspective. My blog started as a passion project and my love of the process has only grown since. I literally have 200 posts on the site… This is incredibly difficult to answer. This post was written about a childhood friend and although it has literally nothing to do with personal finance, it is one of the most powerful pieces I’ve written. I’ve thoroughly enjoyed this interview, Aaron! Thanks so much for lending me the Personal Finance For Beginners audience for a brief piece of time. And if you’ve made it this far – thank you! I’d love it if you’d come on over and check out the site! All the best! Thank you so much for the opportunity to write on the blog, Aaron! I really appreciate the platform and I hope this post can help someone out!